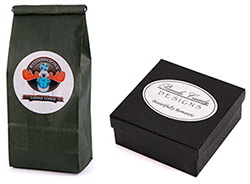 Our beautiful line of two piece folding set-up apparel boxes feature a short lid over a deep base, giving you the look of a rigid apparel box. 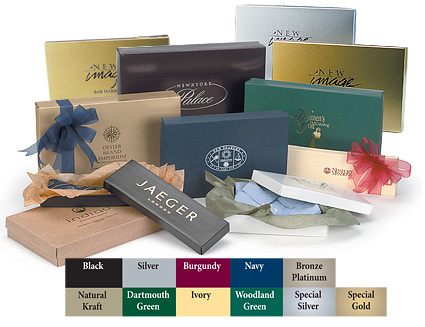 Graced with your signature colors or store logo, your gift will not be the only thing to leave an impression. Boxes ship flat for easy storage. - New simplex style prevents box collapse. - ABFS24144 features a folding set up lid with a lock corner style base. All other bases are folding set-up style. 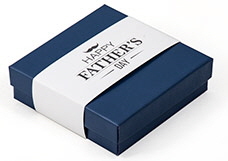 - Most Colors other than White & Kraft are made to order with a 500 piece minimum order and a 3-5 week lead time. --Click For Color And Price Details-- ----------------- Stock Colors ----------------- White Gloss $1.23 ea. Natural Kraft $1.11 ea. (200 min, 3-5 wks) ----------------- Gloss Colors ----------------- Black Gloss $1.63 ea. (500 min, 3-5 wks) Burgundy Gloss $1.63 ea. (500 min, 3-5 wks) Dartmouth Green Gloss $1.63 ea. (500 min, 3-5 wks) Ivory Gloss $1.63 ea. (500 min, 3-5 wks) Platinum Gloss $1.63 ea. (500 min, 3-5 wks) Silver Gloss $1.63 ea. (500 min, 3-5 wks) ----------------- Textured Colors ----------------- Text. Black $1.42 ea. (500 min, 3-5 wks) Text. Navy $1.42 ea. (500 min, 3-5 wks) Text. Woodland Green $1.42 ea. (500 min, 3-5 wks) ----------------- Metallic Colors ----------------- Special Gold $1.47 ea. Special Silver $1.47 ea. --Click For Color And Price Details-- ----------------- Stock Colors ----------------- White Gloss $1.63 ea. Natural Kraft $1.38 ea. ----------------- Gloss Colors ----------------- Black Gloss $1.93 ea. (500 min, 3-5 wks) Burgundy Gloss $1.93 ea. (500 min, 3-5 wks) Dartmouth Green Gloss $1.93 ea. (500 min, 3-5 wks) Ivory Gloss $1.93 ea. (500 min, 3-5 wks) ^ Platinum Gloss $1.93 ea. (500 min, 3-5 wks) Silver Gloss $1.93 ea. (500 min, 3-5 wks) ----------------- Textured Colors ----------------- Text. Black $1.63 ea. (500 min, 3-5 wks) Text. Navy $1.63 ea. (500 min, 3-5 wks) Text. Woodland Green $1.63 ea. (500 min, 3-5 wks) ----------------- Metallic Colors ----------------- Special Gold $2.27 ea. Special Silver $2.27 ea. --Click For Color And Price Details-- ----------------- Stock Colors ----------------- White Gloss $2.27 ea. Natural Kraft $1.96 ea. ----------------- Gloss Colors ----------------- Black Gloss $2.70 ea. (500 min, 3-5 wks) Burgundy Gloss $2.70 ea. (500 min, 3-5 wks) Dartmouth Green Gloss $2.70 ea. (500 min, 3-5 wks) Ivory Gloss $2.70 ea. (500 min, 3-5 wks) Platinum Gloss $2.70 ea. (500 min, 3-5 wks) Silver Gloss $2.70 ea. (500 min, 3-5 wks) ----------------- Textured Colors ----------------- Text. Black $2.39 ea. (500 min, 3-5 wks) Text. Navy $2.39 ea. (500 min, 3-5 wks) Text. Woodland Green $2.39 ea. (500 min, 3-5 wks) ----------------- Metallic Colors ----------------- Special Gold $3.18 ea. Special Silver $3.18 ea. --Click For Color And Price Details-- ----------------- Stock Colors ----------------- White Gloss $2.77 ea. Natural Kraft $2.42 ea. ----------------- Gloss Colors ----------------- Black Gloss $3.20 ea. (500 min, 3-5 wks) Burgundy Gloss $3.20 ea. (500 min, 3-5 wks) Dartmouth Green Gloss $3.20 ea. (500 min, 3-5 wks) Ivory Gloss $3.20 ea. (500 min, 3-5 wks) Platinum Gloss $3.20 ea. (500 min, 3-5 wks) Silver Gloss $3.20 ea. (500 min, 3-5 wks) ----------------- Textured Colors ----------------- Text. Black $2.91 ea. (500 min, 3-5 wks) Text. Navy $2.91 ea. (500 min, 3-5 wks) Text. Woodland Green $2.91 ea. 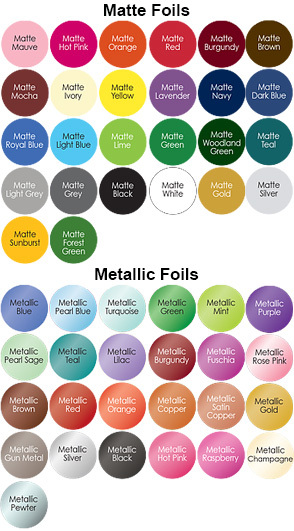 (500 min, 3-5 wks) ----------------- Metallic Colors ----------------- Special Gold $3.78 ea. Special Silver $3.78 ea.